Many different initiatives are required to come together to run a NJ small business, and this website provides a primer about one of them – employee benefits. My name is Greg Colen, and I’m a NJ small business benefits specialist, having helped hundreds of NJ small businesses with their employee benefits over the past ten years. Please see About for more information about my background and activities. This primer is intended for NJ small business owners/operators with 2-20 employees. An employer contribution towards the group benefits is always greatly appreciated! A recent government study reinforces the value of group health insurance as a critical employee benefit, and important to employee financial well-being. For most benefits, you can setup your payroll so that the amount your employees contribute towards their benefits can also be excludable from their gross income. Employers want to retain employees, and they know that the health benefit is often a key. Employees who prefer a cash payment rather than group insurance are more likely to move from job to job, whereas those who participate in group insurance are more likely to stay with an employer. Employers see employee retention as a vital element of a profitable business. Group health insurance is one way to build and maintain a quality workforce, and it is a key tool to reduce turnover. Employers understand how the health benefit affects employees and their dependents. They know that if they employ the spouse who feels responsible to provide health insurance for the family, that employee will remain over the long term. The spouse who is not responsible for health insurance has a different motivation. These are the employees who will change jobs for a small pay increase. Successful employers know that high employee turnover is like a cancer that will eventually eat away at and destroy their business. Employers want their employees to have health insurance. Employers need healthy employees. Health insurance protects the employer’s interest in getting employees back on the job as quickly as possible. Employers know that when they give employees cash – as higher wages or a defined contribution – they may spend it on something else. As a result, fewer employees will be insured. Employers want to recruit the best possible employees. As enticements, they use employee benefits that include time off, retirement plans and a variety of insurance benefits. Of all these benefits, employees value health insurance the most. Employees see the health insurance benefit as something meaningful and important. The health plan design chosen by an employer reflects its character. A paternal employer often chooses an expensive, traditional HMO plan. The employer that trusts its employees to do what is best for themselves offers a high-deductible health plan, often with a Health Savings Account (HSA). The vast majority of employers (even with as few as five employees), however, will offer both plans to provide employees with choices. Reduced premiums are moving ever-greater numbers of employers towards consumer-driven group insurance products, especially as well-informed agents make it their goal to so counsel them. Many employers feel a moral obligation to provide health benefits to employees. Benefits help create a sense of family or community between employer and employees. This directly affects employee morale, and is critical to a business’s success. Beyond retaining/rewarding employees, a properly designed benefits plan promotes wellness, thereby saving personal health and business productivity costs. 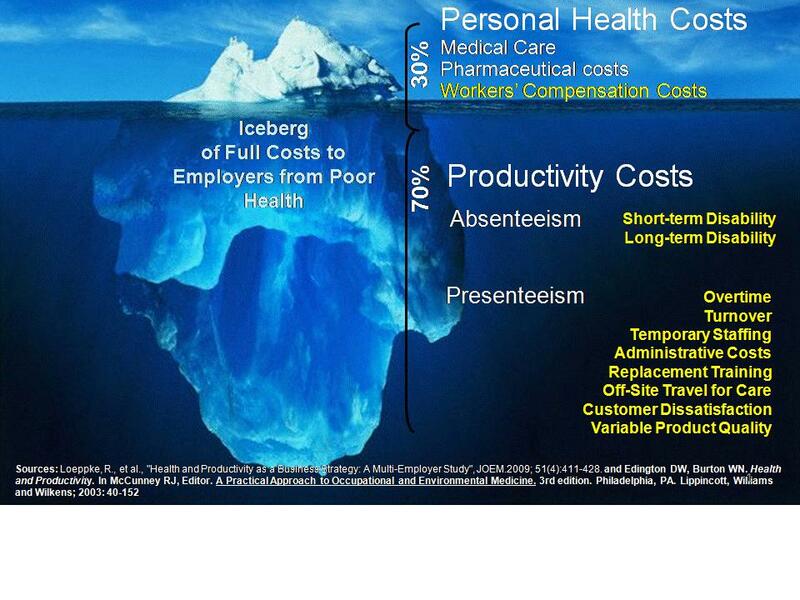 Only ~1/3 of the costs of employee health issues are Personal Health Costs (e.g. medical care, pharmaceutical costs, workers compensation for medical claims, etc.) – the remainder of the costs are Productivity Costs borne by the employer, through Absenteeism (sick days, paid leave, short/long-term disability) and Presenteeism (overtime, temporary help, replacement training, turnover, administrative costs, variable product/service quality, customer dissatisfaction). There are various ways to set-up group medical, dental, vision, Section 105 Health Reimbursement Arrangement (HRA) and/or HSA plans to get the best value. Many of the plans also have wellness and advocacy features that can help use the plan most effectively. A NJ small business benefits specialist can help evaluate costs vs. benefits and maximize plan effectiveness. One of the most common times to work with a NJ benefits broker is immediately after you receive the Rate Increase notification from your existing insurer. Since increases are typically higher than the rate of inflation, it’s always a good idea to shop around, even if you end up staying with your current insurer. Shopping around gives you additional education about new health plan features, and helps you insure you get the best value from your plan. There are certain group benefits that are big satisfiers to good employees, which will also have a big impact to success. From the start, a business needs a good group medical plan. For very small businesses, medical insurance may be enough, but for any startups with plans for growth, a group dental plan is very important to most employees. Again, it should be selected so that there’s a good selection of local in-network providers. Many small businesses neglect to have a group vision plan, but this can be one of the most cost-effective benefits for a start-up company. Not only are the plans popular, but there are inexpensive options. As a startup grows, the benefits plan needs to grow with the company. There are some creative ways that small businesses can use Section 105 Health Reimbursement Arrangements (HRA) or high-deductible-health-plans that are compatible with Health Savings Accounts. Employers also need to have a plan for managing employer vs. employee contributions towards the plan costs, especially considering that the plan costs have trended higher than inflation. Startup employers need to consider the required plan administration, and insure that there’s trained staff able to handle the Human Resource activities that will grow as the firm grows. The cost of benefits can be significant and will vary over time based on the size and type of business. Just as prevailing salaries/wages are tracked by industry/geography, similarly a competitive benefits package will be different by region/industry, and also will evolve based on the labor economy and demand for talent. Some small business owners mistakenly think that they can’t afford to offer employee benefits, but in fact they can’t afford not to. For many jobs, the value of benefits is a significant part of overall compensation, and employers are frequently not able to retain talent if the employee benefits package is not competitive. Beyond the benefits that are required by law (e.g. time off to vote, workers compensation, FICA, unemployment taxes, etc. ), most employers need to offer paid and non-paid time off and other perks. An out-of-network benefit is more important for dental benefits, since dentists are more selective about which networks they use. An experienced broker can perform a network analysis when selecting the dental plan, but the out-of-network benefit will help to cover all bases. If possible, the employer should select a dental plan that allows for immediate coverage of pre-existing conditions (although this costs extra with certain carriers). Many plans limit the amount that the carrier pays towards annual claims, and the employer must consider carefully what limits will satisfy employees. Many small businesses neglect to have a group vision plan, but this can be one of the most cost-effective benefits for a start-up company. Not only are the plans popular, but there are inexpensive options. A lesser-known fact is that a good vision plan doubles as a great wellness benefit! An annual visit to a qualified vision provider can not only correct vision, but also can head-off some serious medical conditions, including diabetes. Wellness programs give businesses the opportunity to take some control of the underlying factors that are driving up their insurance costs. A wellness program may start with a “Health Risk Assessment” (HRA) whereby participants get immediate feedback on the current state of their health. Typically, the HRA will help to identify applicable Risk Factors, while also educating the participant about ways to mitigate them. Employers may use the scores (but not the private medical details) to incent employees to address their risk factors, creating a win-win for employees and employers who actively work the plan. Simple programs, which might have incentives for employees to go to the gym or join weight-loss programs, can pay big dividends. Employees feel better and morale is improved, making the workplace more productive. Wellness programs can also help cut down on sick time and lost work days. Wellness and advocacy programs have been around for a long time, but with the trend towards “consumer-oriented” health plans, with more deductibles and out-of-pocket expenses, both NJ employers and employees have big incentives to promote and improve employee health. Employers may offer basic benefits, and grow them over time to meet the needs of the employees. Frequently, employers will offer a core set of benefits, but offer employees the ability to “buy-up” to better coverage and/or pay towards their benefits to provide coverage to spouses and dependents. Taking the time to work with employees to provide the best overall package of benefits can go a long way to building employee satisfaction, retention and productivity, and a NJ small business benefits specialist can help with this. How Should Employees Be Involved In Benefits Plan Selection? Benefits design is an important activity, and therefore employees should be involved in the process, to get the best value for the benefit dollar. Certainly for network-based benefits (group medical, dental and vision), the network of providers should be evaluated against employee demographics, to make sure there is an adequate network for employee needs. With the high cost of benefits and of the underlying medical care, employers should make an attempt to provide the most cost-effective benefits plans, with the lowest premium that can maintain satisfactory employee cost-sharing. Since group medical insurance is primarily a benefit to limit employee costs in the unfortunate event of a catastrophic medical claim, the employer should consider investing in ancillary benefits (e.g. dental, vision and wellness plans) that will actually save employee money for routine checkups and care. Wellness and advocacy plans are a win-win for an employer, where the amount in invested for a well-designed plan is paid back to the employer through employee productivity. Workers who are educated and involved in benefits design and selection are more likely to use their plans more effectively, and therefore more likely to be satisfied with the benefits. This is another win-win for the employer, since it will lead to greater employee retention and productivity, two major goals of employee benefit plans. Workers need to know the provisions of the benefit plans, and should have readily available benefits summaries and guides provided by benefits plans. Many insurance plans have invested much money to provide on-line tools for self-assessment, quality provider lookup and claims management, all of which can save employees money and help them get quality care. The most cost-effective plans are group plans that have participation requirements (e.g. the higher percentage of employees who participate, the better the plan), so involving the employees to make the best selections, will lead to the highest participation and the most valuable plans. The costs of benefits have risen (and keep rising) so high, that they are now a critical part of overall employee compensation. Until recent history, the only ways to modulate premium increases was to reduce benefits or increase employee contribution to the insurance premiums, and these are still commonly used options, depending on the needs of the business and employees. However, due to participation requirements, if employee contributions are raised too high, the whole plan can be jeopardized due to lack of participation. There are several options that allow employees to share in the tax benefits that employers receive for employee benefits contributions. Employer payroll can be setup to utilize an IRC Section 125 Premium-Only-Plan (POP) to allow for pre-tax employee contributions, which helps employee money go farther. For employee out-of-pocket, cost-sharing expenses for co-pays, deductibles, etc., an IRC Section 125 Flexible Spending Account (aka Cafeteria Plan) can be used to also saves employee money. Another option is for employees to use Health Savings Accounts (which can also utilize a POP plan), with employer contributions to cushion the impact of the Qualified High-Deductible Health Plan (HDHP). As an alternative, some employers choose to self-fund health-plan deductibles through an IRC Section 105 Health Reimbursement Arrangement. Healthy employees will not need to spend as much out-of-pocket, and they will be more productive, so all of these ideas work best in conjunction with a wellness plan to help the employees stay healthy and also advocacy plans to help educate and navigate the employees through the complicated and expensive healthcare system. An experienced benefits specialist can help with this also! Know what will happen if you lose coverage. For complicated or expensive procedures, prescriptions, dosages, etc., providers of care may be responsible to get pre-authorization from the plan prior to providing care – it’s a good idea for you to check with your insurance carrier for each procedure! In addition to the above, insurance carriers will generally only cover medically necessary procedures! Wrong service dates, billing address or patient information. Help cut through insurance red tape! Running a small business is subject to many trade, environmental and labor regulations, and some of these also apply to benefits plans. The federal government is the principal regulator of employee benefit plans, determining factors such as tax-favored status, reporting requirements, privacy, eligibility, non-discrimination rules and continuation of coverage after termination of employment. Some of the federal laws include: ADA, COBRA, ERISA, FMLA, GLBA and HIPAA. For NJ companies with less than 20 employees, the NJ State Continuation (NJSC) statute applies, rather than COBRA, for providing benefits to employees after they have left employment. To help with regulations such as these, small business owner/operators should attend continuing education and work with professionals to resolve specific issues. NJ benefits brokers are required to receive continuing education, and membership in the National Association of Health Underwriters (NAHU) is critical to ensuring proper training, professionalism and understanding of new employee benefits laws and regulations. All insurance companies and group health plans must use the same standard SBC form to help compare health plans. The SBC form also includes details, called “coverage examples,” which are comparison tools to show what the plan would generally cover in two common medical situations. Members have the right to receive the SBC when shopping for or enrolling in coverage or can request a copy from the issuer or group health plan. Members may also request a copy of the glossary of terms from the health insurance company or group health plan. Another good example of employee benefit plan regulations concerns insurance company and IRS regulations surrounding employer and employee contributions to the benefit plan premiums. While the insurance companies are primarily concerned that the employer contributes sufficiently towards the premium, the IRS has become more concerned with discrimination in favor of highly compensated employees. This issue can also get complicated by the type of business formation (e.g. partnership, S-Corporation, etc.). It is important for small business owners/operators to stay apprised of evolving regulations to the stay in compliance, and working with professionals including an experienced broker is recommended to get the latest information. State laws generally follow model laws developed by the National Association of Insurance Commissioners (NAIC), to specify standards to mandate benefits and regulate policy provisions, exclusions and limitations, company ratings and loss ratios. Within NJ, group health insurance plans are regulated by the “Small Employer Health (SEH) Board” and here’s a link to a very useful guide which I’ve had many opportunities to read. But even an established marketplace like the NJ SEH Program undergoes revisions due to new laws such as PPACA, and there are ongoing updates to SEH regulations to be in compliance with the new law. Of course, an experienced broker will also be very helpful with compliance issues! With open enrollment approaching for many businesses, it’s a good time to take stock of the general options for NJ group health plan members. Many NJ carriers offer Health Maintenance Organization (HMO) plans. With an HMO, you choose a primary care physician (PCP), who directs your medical care and gives you referrals when you need to see specialists. However, modern HMO’s come with a no-referral option, if you’d like to be able to see a specialist without a referral. With an HMO, you must go for medical care within your plan’s network or you won’t be covered (except for Emergencies). Most carriers also offer Point-Of-Service (POS) and Preferred Provider Organization (PPO) plans, which provide an out-of-network benefit (if you have to see providers who don’t take insurance). In-network, these plans work very similarly to an HMO. For dental plans, an out-of-network benefit is more important, since NJ dentists are more selective about which networks they use. NJ medical plans can be structured in such a way that they are compatible with Health Savings Accounts (HSA’s). The premium for this type of plan is lower, since the plan has a broad deductible that must be met (except for Preventative care) before the carrier subsidizes claims. Employees can open an HSA (typically at a bank) to put tax-deductible money (e.g. the premium savings and/or an employer-match, if applicable) to cover the plan deductible and other qualified medical, dental and vision expenses. The HSA money belongs to the employee and can carry over from year to year. Alternatively, some employers will use an HSA-compatible health plan to establish an IRC Section 105 Health Reimbursement Arrangement (HRA) for their employees (in this case, employees can NOT open HSA’s). The employer will use the premium savings from the health plan to insulate their employees from the plan deductible, by reimbursing qualified employee claims on a tax-preferred basis. If the employees are typically healthy, this can save money for both employer and employees. Wellness and advocacy plans are especially valuable to a company and employees when HSA-compatible health plans are used, since reduced claims lead directly to savings to the participants. A bigger component of savings is Productivity (including less sick days, etc.) due to reduced absenteeism and presenteeism. A lesser-known fact is that a good vision plan doubles as a great wellness benefit! An annual visit to a qualified vision provider can not only correct vision, but also can head-off some serious medical conditions, including diabetes. Prior to open enrollment, it’s a good idea for employees to evaluate potential health care needs. Knowing past history can help plan for the future, so employees should review past claims (medical, prescription, dental, vision) and costs (both co-pays and the total cost of each claim). To get a view of the future, employees should consider whether the claims were predictable (including chronic conditions) or unpredictable (emergencies)? Knowing this type of information is very helpful for evaluating options at the time of open enrollment and/or to ask for options from carriers and brokers. An employer should start considering employee benefits plan needs roughly two-months prior to the plan anniversary. The employer should survey employees to consider their demographics, expected utilization and special needs. The employer should establish a budget for benefits, considering carefully what employee contribution might be required to maintain ample participation in the employee benefit plans. With the help of a broker, the employer should consider offerings by competitive, high-quality providers as an alternative to the existing plans. Before making any changes, employer and employees should be aware of what they will be getting, compared to their current benefits. At the end of this process, the goal is for the employer to continue to have loyal, motivated employees who are happy that they are getting the best value for the healthcare investments. An experienced broker can help with all aspects of this process, from checking health plan prices, to helping employees understand their options. For a NJ Benefits Specialist (depicted in the upper right-hand corner), there are many different types of interactions for NJ small business employee benefits. One of my customers opened a branch in GA, and needed a plan with a network that has doctors there – we’ll switch to at his upcoming plan anniversary. One of my NJ customers turned 65 and enrolled in Medicare January 1st. Since she was the last employee on her company group plan, we just term’d her retroactively to 1/1, so the group policy will terminate and the NJ insurer will stop billing, whew! Today, I enrolled into a NJ employer group health plan an employee who was promoted from part-time to full-time, making him eligible for benefits. I found out that some NJ group health insurers offer free/inexpensive flu shots. A NJ employer called to ask me if the 90 day Waiting Period (before an employee can be eligible for employer benefits) also applies to a re-hire? Of course, I can get the answer for that! One of my NJ customers mistakenly faxed a group medical change form directly to the insurer. We sent in a Corrected Form and I’ll followup to make sure the first incorrect form is disregarded. Yesterday, I was shocked to get a call from a NJ group health insurance member whose wife had a stroke. Luckily his NJ company is insured by a very good insurer, who’ll assign a case manager to help. Today, a NJ customer called me to help her with new job benefits. She isn’t sure she’ll stay at her new job and wanted to trade-off COBRA vs. re-enrolling in NJ Individual Health Insurance. My latest work item is to help a NJ employee drop his daughter from his NJ group coverage, since she got a job (hooray!) with benefits that started last month. The carrier will probably process it retroactively if she had no recent claims. With the turning of the New Year, I spent this week verifying that my NJ customer group health plans renewed ok, and sending the updated Benefit Summaries to the employers to share with their employees, to comply with the new regulations. Whew! I just helped a NJ landscaper change from co-pay based plan, to HSA-compatible plan. It’s a husband/wife business, so we moved the spouse under one family plan (to save on the deductible) and added a dental plan. Yesterday, my issue-of-the-day was to get three NJ employee enrollment forms, processed retroactively. Luckily the NJ insurance company was granting generous exceptions due to the difficulties caused by Hurricane Sandy (boo). One of the most fun activities for a NJ benefits specialist is when a customer’s employee has a baby! His wife works at a bank and will be going on leave, so he called me to work on adding his wife and newborn to his current single coverage. Very nice, I received a referral from a sister at one NJ business customer, to her brother who owns NJ retail store and received an above-average group health insurance renewal rate increase. Received another referral, when one of my customers had dinner with the wife of a landscaper, who had very rich benefits they don’t need, that they had purchased directly from the insurance carrier. NJ group rates are the same whether you buy through a broker or directly (if you buy directly, you don’t get broker services). Today, I processed an Address Change, for a NJ customer who moved, and needed to switch plans to one that supported multiple states. Today, I got quotes/alternatives for two new NJ customers who didn’t know where their brokers had gone. My latest problem is an employee who dropped of her employer NJ group medical plan, to enroll in NJ individual health insurance … except the insurer is still billing the employer, due to a computer glitch that I had to track down! Now is the time of year where many employees have to make “Open Enrollment” decisions at work. I received a call from a NJ small business owner, who was trying to decide between her husband’s corporate benefits, and her own NJ group health plan. Yesterday, I worked with a business owner, whose son has NJ individual health insurance, but works part-time for the business, and can be eligible for benefits just like any other employee. A customer called with a pile of invoices, not sure how to pay them out of his Health Savings Account. An employer, who was pre-occupied with Hurricane Sandy, called to say he missed open enrollment, and wanted to make a mid-year plan change. I got a call from a customer at her doctor’s office, who requested that she pay the entire plan deductible, up front, before getting service. Worked today with a NJ employer who needed a plan with a multi-state network that would help an employee working in NC. Today, I helped two different NJ customers fillout their Small Employer Certification, an annual audit required by NJ to maintain group health insurance policies. A lot of technical questions on the forms frequently confuse my customers! I just received a request for proposal from a customer who is starting a new 5-person trucking company, and wants to offer benefits. It’s a family business, so I have to run the quote multiple ways (family vs. single + parent/children) to give them the best options. One of my customer’s employees is now eligible for Medicare, but his wife isn’t. So as he is dropping off his employer’s NJ medical plan, I’m helping the wife enroll in NJ Individual Health Insurance. Today, I worked with a young man who “aged-out” of NJ “Dependent Under 31” Coverage, so I helped him enroll in NJ Individual Health Insurance. Today, I completed the processing of two NJ Individual Health Insurance (IHI) applications, and then got a call from another person (sole proprietor) who didn’t qualify for group coverage and also wanted IHI. Yesterday, I completed working with a very small NJ business to setup a group dental plan with no pre-existing condition exclusion. The carrier came back with higher rates, since the customer is in a “loaded” industry. I had to research their SIC code to find out that they had filed their business registration (to NJ) with the wrong code! Today, I visited a work location of Horizon Blue Cross Blue Shield of NJ – they treated me like a rock star (I can’t sing or dance)! I just submitted a NJ group health insurance renewal, for a customer who eliminated one of their plan designs (moving all their employees into a single plan design). One of my larger customers is switching carriers to save money. I’ll be conducting an “open enrollment” meeting with the employees within the next two weeks. Recently, I helped a customer who had two employees, husband and spouse, who needed to evaluate whether it was better to have their kids covered under father or mother … or whether father or mother should cover the entire family? Today’s issue was helping a customer understand the tax treatment of employer contributions to an employee’s Health Savings Account. I checked with the IRS and worked with my customer’s tax accountant to evaluate a couple of scenarios. Now, I’m processing a NJ employee termination form for a NJ small business customer, since the ex-employee is not electing “NJ State Continuation” (e.g. mini-cobra). Yesterday, my issue was getting a new NJ health insurance ID card for a customer who doesn’t speak English. Luckily, the insurer has an interactive-voice-response system, which works using touch-tones! An experienced benefits specialist and broker provides a variety of services!